This is one of several pedestrian walk-throughs under the N&S lines in Williamson. I show this to contrast to how St. Paul VA solved their problem with the rail line: they took the whole street under the tracks. 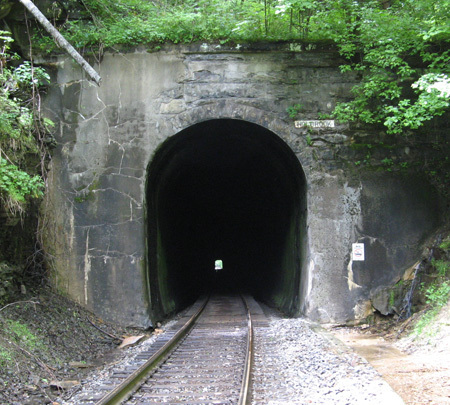 The third tunnel between St. Paul and Coeburn is Holbrook. It centers at 36.924873, -82.372080 and is about 1,600′ long. A trestle begins 11′ or so inside the northwestern portal and extends 625′ over a valley. It’s dated 1947, but, since the tunnel was blasted out around 1905, we know it’s a replacement for the original timber trestle (and it must have been some trestle!). There are two more trestles before we get to Coeburn, both high and long. After Big Bull tunnel going roughly northwestward on the N&S line from St. Paul to Coeburn is Little Bull tunnel. It centers at 36.916845, -82.364497 and is about 400′ long, on a curve. 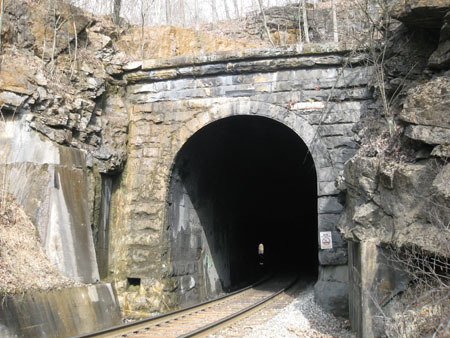 Backing up a little bit to St. Paul VA, this is Craigan Tunnel (you can’t see the sign on the right side of the portal very well, but it states the tunnel name as “Creagan”) at 36.902711, -82.328600. 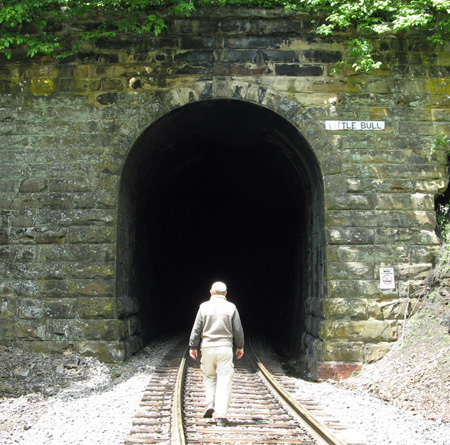 The tunnel is about 900′ or so long. The date on the tunnel lintel is 1905. It was part of the Interstate line then, now it’s a N&S property. There was a huge fire in this tunnel in September of 1903 that required the St. Paul fire department, along with others, to build dams at either portal of the tunnel and pump it full of water. We started to walk through this tunnel, but decided not to. Good plan, that. Just as we climbed over the tunnel, a N&S double locomotive coal train came rolling through. And we’ll be rolling back to the CSX to Speers Ferry tunnel shortly. 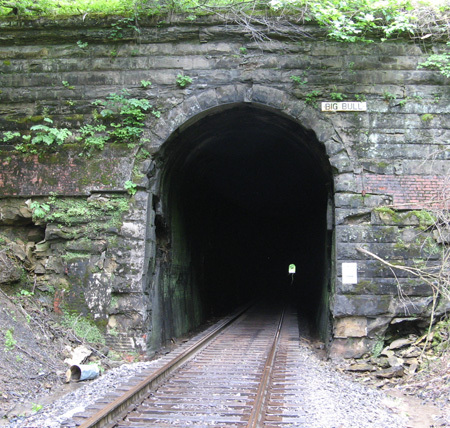 There are three tunnels on the Norfolk and Southern line between St. Paul northwestward to Coeburn. They’re all old tunnels and faced and dated at time of construction. This is Big Bull tunnel, centered at 36.917577, -82.359635. It’s about 1,500′ long. Date’s 1904. I particularly like how these tunnels were finished up. Nice stonework.